Nokia is making a move into the teen phone market with its Nokia X5-01 square-faced slider hailed by the handset maker as "a social media maven's mobile" phone. It supports IM and e-mail services as well as social networking sites such as Facebook, Twitter, MySpace, and Hi5 directly out of the box. The Nokia X5-01 is expected to be released in Indonesia later this year for around $200. No word yet on when or if we will see this chubby phone here in the US. 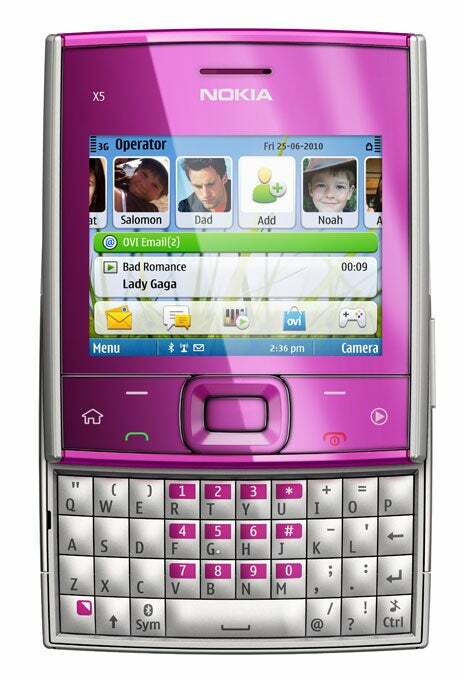 Geared specifically toward youngsters, the phone, which runs the Symbian S60 3rd edition OS, will be available in a variety of colors ranging from a bright pink and green to a more subdued purple and blue, and will have 200MB of built-in storage with microSD expansion support for up to 32GB. The phone has a 5-megapixel built-in camera for snapping photos on-the-go, QWERTY keyboard for texting and tweeting quickly, and dedicated music keys for blasting tunes through the handsets speaker system. Teens can spin the phone to change the song currently playing on the phone, and shaking the phone will display unread e-mails. Nokia has released a video of the X5-01 in action here . The N5-01 is strikingly similar (even in its square design) to the Microsoft Kin One announced in April . Also social media-centric the Kin offers users the ability to share pictures, videos, photos and status updates by simply dragging and dropping them onto the friend or site where they want to share them with. Microsoft offers two versions of the phone: the square Kin One with a 5-megapixel camera and 4GB of built-in storage, and the rectangular Kin Two with an 8-megapixel camera and 8GB of built-in storage. Motorola also announced a square-faced social media phone earlier this month, the Motorola FLIPOUT. The Kin One and Two will both be available in the US on Verizon later this year.